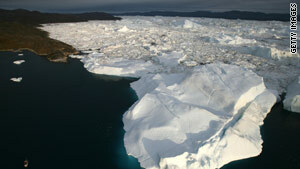 The melting of ice caps in Greenland and the Antarctic could mean sea levels rising by 0.5 meters, the report says. London, England (CNN) -- A possible rise in sea levels by 0.5 meters by 2050 could put at risk more than $28 trillion worth of assets in the world's largest coastal cities, according to a report compiled for the insurance industry. The report focuses on regions and phenomena where such events might be expected to cause significant environmental impacts within the first half of the century. For example a hurricane in New York, which could cost $1 trillion now, would mean a $5 trillion insurance bill by the middle of the century, the report adds. "If we don't take immediate action against climate change, we are in grave danger of disruptive and devastating changes," said Kim Carstensen, the Head of WWF Global Climate Initiative. "Reaching a tipping point means losing something forever. This must be a strong argument for world leaders to agree a strong and binding climate deal in Copenhagen in December."